Ya I would take the Toronto star with a huge grain of salt. They’re huge liberal supporters. Its numerically obvious that the Ford numbers have to do with liberal supporters jumping on board. I think suggesting the ONDP supporters are boosting conservative numbers is a game to hide the lack of ethical value many liberal supporters have. So are you saying that Ford is attracting ZERO NDP supporters? That it is all Liberals supporting Ford. One thing that is interesting is that everyone is cheerleading for Forum, which shows the NDP moving up. This is the same polling firm many on this board have said is just an extension of the Liberal Party. But now that they show poll after poll that the NDP are moving up, that narrative (Forum = Liberals) has been thrown out the window. Now Forum Research (whom Now Magazine calls a Conservative pollster) is the NDP best friend. Interesting that the polling firms who have questionable techniques & methodology (MainStreet & Forum) show the NDP in 2nd with the Liberals trailing badly. While the more respected firms like Nanos & Abbucus have the Liberals second. Which says to me that these Conservative Polling firms (Forum & Mainstreet) are deliberately pushing out a narrative in the media to vote NDP. That way the vote is split and would allow the Conservatives to come up the middle. But then again everyone here will say that Forum & Mainstreet are to be trusted since they show the NDP in second. Even though in 2015 when these firms showed the NDP & Mulcair in third everyone here said they were not to be trusted because they were in bed with the Liberals! That poll makes no sense and is pulled out of reality. 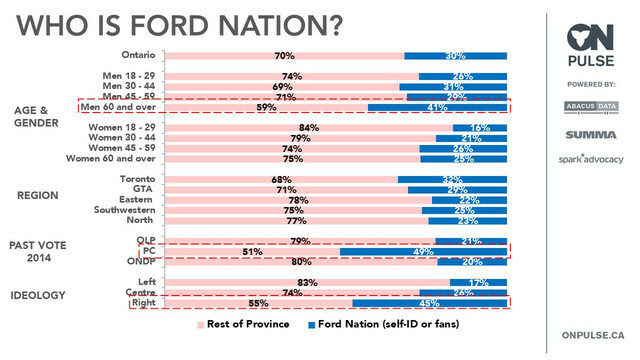 When a poll uses the term “Ford nation” don’t expect me to give it a spit of credibility. According to that poll, the pc are running at 49% and the liberals and ONDP are tied. From the Forum poll which has the race at 40% PC, 33% NDP, 22% Lib. And when Forum had the Liberals first in 2015 election weren't you the one saying that Forum is in bed with Liberals? Now 3 years later, you've thrown out the window embracing Forum as gospel! Translation the only polls you believe are the ones that only show the NDP in a positive light. Anything else is not to be believed. Well it is terrfic that you admit you are bias when it comes to polls. Now if only Ken Burch could admit that as well. I never even attempted to imply I’m biased! Polls are biased and skewed, no argument there. My logical explanation would be that if these polls that are slanted against the ONDP are showing them with high numbers, then the ONDP are realistically even higher. I don't have bias in terms of polls. The trend in almost ALL polls, though, has been that the NDP has been gaining ground, at worst tied with the Liberals, ahead of them in most, while the PC's have been stable. And that wasn't the latest poll you're showing. You've been posting that same graphic for weeks now. It's from an OLD poll. There's no continuous finding that a large bloc of ONDP supporters are actually planning to vote PC. Identifying as a member of "Ford Nation" doesn't mean anything more than identifying as a member of the alienated working-class. It doesn't equate to support of Ford's ideas or a commitment to vote for the guy, and it's not a rejection of the ONDP. I admit I prefer seeing polls showing the parties I support doing better than polls showing the parties I support doing badly...which is the case for everyone, including you. Here's the reality...there is NO recent preponderance of polls showing the OLP doing better than the ONDP, OR supporting the argument that voting OLP is the only way to stop Ford. And the plain and simple fact is, you know it. That's why you keep running that outdated and meaningless graph about identification with "Ford Nation". You are desperate to create a narrative that Ford is surging, the NDP is collapsing, a lot of NDP supporters are secretly reactionary, and therefore that voting Liberal is the only way to stop the guy. Problem is, nothing in polling reality comes anywhere close to supporting that narrative. If you want to make an argument that people should support the party you prefer, fine, make it. Make it on the merits of that party as you see them. There's no excuse for you attempting to make it by making bogus insinuations that a large chunk of traditional ONDP supporters back Rob Ford, that the number of such people is growing(the polls prove that it is shrinking rapidly) and that those still loyal to the ONDP have an obligation to vote OLP out of the delusional notion that the OLP can beat Ford but the ONDP can't. Whatever bias I may have pales the bias you seem to have against acknowledging the fact that your argument, your "vote for us ONE more time" argument, is no longer grounded in reality. Nowhere in any of my replies did I ever suggest you need to vote Liberal to stop Ford. All I have said since day one is that Ford Nation is comprised of Liberal and NDP supporters. The ONLY poll that comes close to supporting your argument is the Nanos poll...a poll released three weeks ago. It's the ONLY one that shows the Liberals running in a solid second and the NDP out of contention. Given the degree to which it is at variance with every other trend, and given that it was taken well before Horwath's solid victory in the debates. it can be characterized as an out come that that was and is a "rogue poll"-it was an anomalous outcome that has no relation to the actual level of support each party has and the potential support each party could potentially add to its current total. I'm not in deep denial about "Ford Nation appeal". It's just that several of us have demonstrated to you that "Ford Nation appeal" is not synonymous with liklihood to vote PC, that "2014 NDP voters" is not the same thing as "traditional NDP supporter", and that the string of polls taken since that graphic from that one poll you keep posting demonstrate that the rise in NDP support means that any support for Ford among NDP voters is rapidly declining. I agree that a demagogue(he's not a populist, he's a demagogue) can take votes from any sector-that's what demagogue's specialize in doing. However, the SERIES OF POLLS showing flatlined-to-slow declining level in PC support, accompanied by a dramatic rise in ONDP support, indicate that the appeal of the demagogue is declining. They also prove that the claim that the OLP is the only party that could stop Ford is now utterly bogus. The ONDP has responded appropriately to the "Ford Nation" challenge: It has reconnected to those within its ranks who were tempted by Ford as an expression of their outsider statuse, it has gain votes from those people who always vote Liberal because they believed that only the Liberals could beat the PC's, and it is gaining the votes of people who hadn't backed major parties in the past because the party is running on a program this time that actually connects with their need. I've addressed your point. The ONDP has addressed your point. What else do you want from everybody about this? If you aren't still pushing the discredited idea that somehow the OLP is the only party that can stop the PC's, what ARE you saying here? And what will satisfy you that you no longer have to keep posting that graphic and spamming a myth about ONDP voters? ​What, in short, do you want here? Former card carrying NDPer and Jack Layton supporter (who supported him in the leadership) is now openly supporting Ford, and using his bully pulpit to convert other dippers into the Ford column. In fact he is trolling neighbourhood in Brampton to turn those ridings PC. The bad news for the NDP in Ontario is that they seem to be bleeding votes to the PCs, instead of the other way around. A poll released this week by Angus Reid shows the PCs ahead of the Dippers among voters who identify as working class. Talk about the pot calling the kettle black! You have polls that you love to quote. By the way, your Ekos poll is dated April 6th and was conducted from March 20 to April 5th. Kind of out-of-date. Doug Ford sees approval from one-third (34%), and disapproval from half (49%). About one-sixth (17%) say they do not know. His net favourable score is -15. Horwath’s approval is 4 in 10 (42%), with one-quarter (25%) saying they disapprove, and a third (33%) saying they do not know. Three quarters (74%, down 3 points) of Ontarians believe that it is time for another provincial party to take over at Queen’s Park, while just 23% (unchanged) believe the Wynne government has done a good job and deserves re-election. Don't like those results? How about the Abacus poll conducted from April 30th to May 6 ? Mighty Middle you seem to be in a state of denial about the unpopularity of Wynne. Because modern elections are primarily driven by party leaders and their popularity, this is an enormous problem for the Liberals. Here are several analyses of why this is the case. Admittedly, these analyses are somewhat older than the polls I cited in the last post, but her popularity has only shown small improvement since these articles were done. The analyses come from several different pollsters, in case there is one you particularly don't like. Perhaps, you are out of touch with regular people, like Wynne, as the analyses suggest. Or maybe, you know that, like her political team, you already know what the situation is and that the lack of trust in her is "the kiss of death". Maybe you're even part of that political team. Polls by three different firms in recent months suggest that just 13 to 16 per cent of voters approve of the job Wynne's doing. One pollster, Forum Research, called it "the lowest value we have ever recorded for a sitting premier." There's no doubt hydro is a big issue — so much so that tackling electricity costs will be the Liberals' chief priority in the upcoming budget. But a bill that arrives once a month can't alone account for the extent of disapproval for Wynne. There must be something more fundamental. Liberal sources tell me their own polling finds Wynne is scoring badly with voters on such measures as "understanding the pressures in my daily life" and "understanding my situation." In short, she's seen as out of touch with regular people. Other pundits are all but writing Wynne off. "There comes a point with governments when there may be little they can do to change circumstances, particularly after a party has been in power for a long time," said Shachi Kurl, executive director of the Angus Reid Institute. Wynne remains the most unpopular premier in the country. Kathleen Wynne doesn’t seem to be gaining any traction among voters in Ontario as she remains the most unpopular premier in Canada with a provincial election slated for June, according to a new poll. A survey by Angus Reid Institute, released on Wednesday, found Wynne’s approval rating is stagnant at 19 per cent, just one percentage point lower than numbers reported in December, and seven percentage points more than her lowest recorded rating of 12 per cent in March of last year. Another earlier poll even suggests that Wynne could lose in her own riding. With the province seemingly ready to vote out the Liberal party in the upcoming June election, a Forum Research poll conducted on March 11th, the day after Doug Ford was announced the PC leader, concludes the 416, which is traditionally a Liberal stronghold, could start turning Tory. My personal opinion is that it is not scandals that have made Wynne the most unpopular premier in the country, although they helped. Nor is it simply the desire for change: Ontario and Alberta governments stayed in power for over 40 years in the past. It's primarily the loss of trust due to the promises made in the 2014 government that made it seem her government was going to carry-out major left-wing oriented reforms followed by three years of austerity. That's why even though the Ontario economy is growing and unemployment is down, people don't trust her. So that's why new promises and in some cases actions, such as the $15 minimum wage, are ignored because, people do not believe the new promises will be implemented based on their past experience. Mighty Middle you seem to be in a state of denial about the unpopularity of Wynne. Because modern elections are primarily driven by party leaders and their popularity, this is an enormous problem for the Liberals. Can you provide posts where I mentioned Kathleen Wynne? I'll save you the trouble, I never once mentioned her in terms of the Ontario election. All I'm saying is that Ford Nation has attracted NDP supporters. But seems posters here are in utter denial about it. Then you DELIBERATELY left this poll out showing the Liberals ahead of the NDP in Toronto, tied with the NDP in the GTA and ahead of the NDP in Eastern Ontario. Again cherry picking. The Pollara poll was an online survey of 1,011 Ontarians who identified themselves as eligible to vote in the election. Talk about cherrypicking. In the Abacus poll you mentioned that showed the NDP and Liberals tied, the same two lines shows the NDP have gained 5% but the Liberals are only +1 compared to Abacus's previous poll. In other words, the NDP has made a statistically significant gain in support, while the 1% Liberal gain is statistically insignificant since it is less than the margin of error. Five of the last five polls as of tonight and since May 4th, three show the NDP ahead by 3%, 7% and 11%, one is a tie, and one has the Liberals ahead. As for Eastern Ontario, that has always been the poorest region for the NDP electorally. However, in your cherrypicking you failed to mentioned you failed to deal with Wynne's disapproval ratings which typically have ranged in the 70-80% range. It is the extreme unpopularity of Wynne, the most unpopular premier in the country, that is driving Liberal support down while the NDP is growing in popularity as would be expected in the modern leadership driven campaigns. One pollster, Forum Research, called it "the lowest value we have ever recorded for a sitting premier." And yet in the 2015 election a majority of posters here said Forum Research is not to be trusted because of their ties to the Liberal Party. But now that Forum has releases poll after poll with good news about the NDP, the narrative of Forum being a fake pollster has been thrown out the window! So now you don't like Mainstreet and Forum. 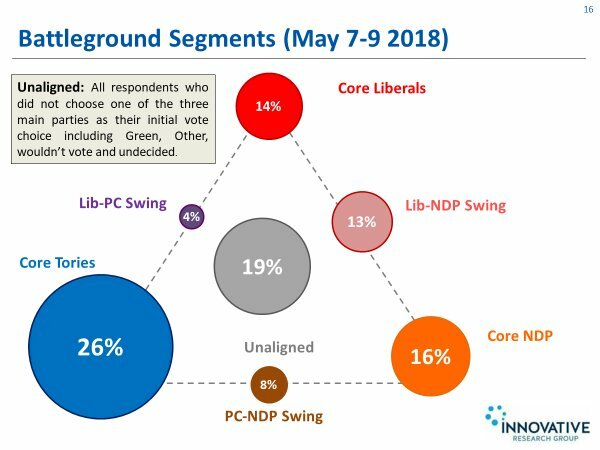 However, of the six polls conducted in May four show the NDP ahead of the Liberals (Forum, Mainstreet, Ipsos and Pollara), one shows them tied (Abacus) with the NDP up 5% from their previous poll, and only one shows the Liberals ahead (Nanos). No doubt you now take Nanos as the gospel. You also seem to be in denial of Wynne's unpopularity, as evidenced below. The Liberals appear to be fading. Angus Reid, Forum and Mainstreet all have ties to the Conservatives, and previously posters here on Babble would point out that fact over and over and over again. In particular Angus Reid had that poll about Omar Khadr that has been subject to questions for the bias in that poll. But now that these pollsters are pushing for the NDP in second, these formerly "conservative" pollster are now the word of gospel with babble posters! I just wonder how you will twist yourself in a pretzel if (and I say IF) these same pollsters show Jagmeet Singh a distant third. How you will dismiss those pollsters in 2019, when a year earlier they could do no wrong in the 2018 provincial election. Because it would take a politcal earthquake to have Trudeau in third, Scheer in first and Singh surging to second. Not impossible, but again it would take a political earthquake for that scenerio to happen. Huh??? Mainstreet is run by Quito Maggi who is very much a big L Liberal and who has managed Liberal campaigns in Sudbury in the past. Forum is run by Lorne Bozinoff who i do not associate with any party but if anything I usually find their spin in press releases of their own polling to be VERY pro-Liberal. As for Angus Reid, they seem pretty small "l" liberal and their polling in BC if anything tends to be favour the NDP. I would add that one of the most damning polls of all in Ontario was the one by Pollara this past week which had the NDP at 30% and the Liberals down to 23% - and Pollara was until recentyly the Liberal Party's official pollster and is run by Don Guy the former chirf of staff to Dalton McGuinty. Snooze. Parsing political affiliations of pollsters is the stuff of losing campaigns. They're all doing their best to gauge public opinion and, as we have seen, their best hasn't been all that good recently. We'd be better off tanking the results with a grain of salt and considering why/how they are getting the results they are and how they apply to votes on the ground - rather than justify results by who did work for whom and when. I would add that one of the most damning polls of all in Ontario was the one by Pollara this past week which had the NDP at 30% and the Liberals down to 23% - and Pollara was until recentyly the Liberal Party's official pollster and is run by Don Guy the former chirf of staff to Dalton McGuinty. It was an online poll, and studies have shown most online polls that use participants who volunteer to take part DO NOT have a proven record of accuracy. Online Polls Are Rising. So Are Concerns About Their Results. The only poll you are willing to accept is one that shows the Liberals ahead. You're spinning out of control in your trolling. Here's an a poll analysis from a fourth polster, Pollara, that once again shows the Liberals in trouble. In Toronto, of the anti-Ford voters who are Liberals, 84 per cent said they’re likely to switch to the NDP if it looks as though they’re going to be the most likely to stop Doug Ford, the poll found. An anybody-but-Ford movement is percolating as the June 7 election draws closer, with Kathleen Wynne's Liberals at the biggest risk of being left behind, suggests a poll provided to the Star. Swaths of Liberal and NDP voters most firmly opposed to Doug Ford are preparing to switch allegiance if the other party appears to have a better chance of stopping his Progressive Conservatives, said Craig Worden, president of Pollara Strategic Insights. The likelihood is stronger in Toronto than in the rest of the province and is a red flag to the Liberals because they have a higher percentage of voters motivated mainly by anti-Ford sentiments than Andrea Horwath's New Democrats, Worden added. "The Liberals may stand to lose many ridings in their base of Toronto." Overall, the poll conducted May 3 and 4 found Ford ahead with the support of 40 per cent of decided voters to 30 per cent for the NDP and 23 per cent for Wynne, as has been previously reported. A further breakdown of the results shows that province-wide, 60 per cent of NDP voters motivated to back Horwath by their opposition to Ford said they are likely to switch to the Liberals if necessary, while 78 per cent of Liberal voters were ready to back New Democrat candidates. Here's an a poll analysis from a fourth polster, Pollara, that once again shows the Liberals in trouble. Pollara only does online polls (which this poll was, an online poll), and studies have shown most online polls that use participants who volunteer to take part DO NOT have a proven record of accuracy. 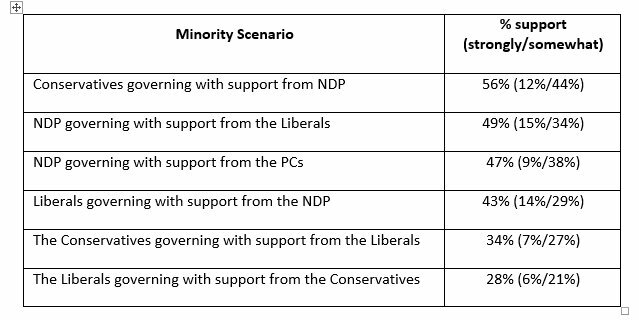 NDP/Liberal and Liberal/NDP are the two most strongly supported minority scenarios. If it has to be a minority, I dont mind that at all. We see what we want to see I guess. If the roles were reversed and the Liberals were 5 points behind Ford, everyone would be saying "Don't Vote Out Of Fear"
So after YEARS of decrying strategic voting, now everyone on this board is advocting strategic voting to STOP FORD by voting NDP.